A couple friends of ours have been using a service called Blue Apron lately. This service provides the all ingredients needed for you to cook one meal for two people. The spices and sauces are already measured out according to the recipe’s needs. 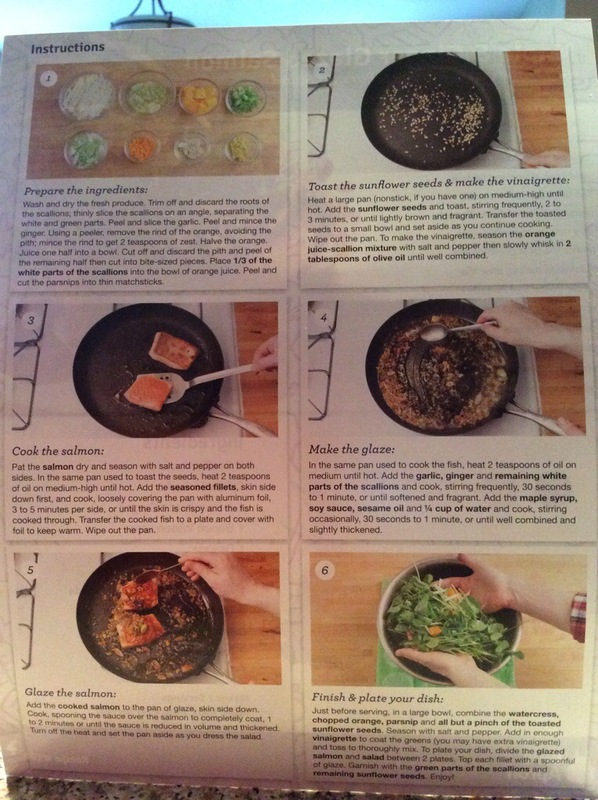 Each meal comes with a recipe card and step by step instructions. This is such a fantastic idea for those that are very busy during the week with a limited amount of time. Our friends are heading out of town and we were fortunate enough to try it out ourselves! Easy. Simple. Decent explanations for instructions. Not always good for the diabetic (this recipe used maple syrup). Preparation for this meal between both of us took approximately 10 minutes. Cook time was approximately 15 minutes. Portions were small for Tom’s liking. Great for the people who are indecisive regarding what to make for dinner. We thought of some great ideas on how to modify this recipe. Loved the watercress salad – simple ingredients, fresh and tasty. 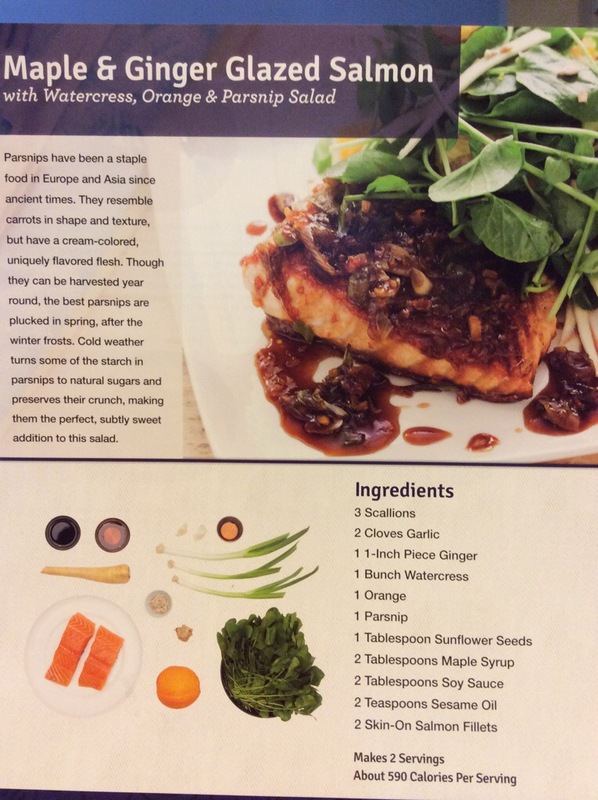 Maple glazed salmon – sweet for our liking, would have substituted the maple syrup for coconut sugar, used 1/2 the amount of soy sauce, more scallions in the glaze, and brushed sauce onto salmon instead of putting back in the pan (takes away the crispness of the salmon). Tasted much like an orange chicken type of sauce which was yummy. Might have to try this with chicken! Overall, great experience. Fun to do with your honey boo-boo or friends. Good bases for other recipe ideas. And well, who doesn’t love cooking!! We would definitely try this service in the future! Categories: Dinner | Tags: dinner, easy prep, food, orange, parsnip, salmon, watercress | Permalink.